Tim Peek helped his Spartanburg Phillies to the league championship. His team helped him - and themselves - win it. After Peek gave up the go-ahead run on a ninth inning wild pitch, Spartanburg came back for the win and the 3-0 series victory, according to The Spartanburg Herald-Journal. "This is the World Series!" Peek told The Herald-Journal afterward. "I kept hoping we'd get a chance to come back. These guys did it all." Peek helped is team to the South Atlantic League championship in his second pro season. He went on to play in nine pro seasons, but he never made the majors to get a chance at the real World Series. Peek's career began in 1987, taken by the Phillies in the 33rd round of the draft out of Elkhart Memorial High School in Indiana. Peek started between short-season Utica and single-A Spartanburg. He went 3-4 between them, with 2.64 ERA. He moved to Spartanburg full time for 1988, going 6-3, with as 1.87 ERA. He also saved nine games. He split 1989 between Spartanburg and single-A Clearwater. That July, Peek struck out five in a relief appearance. "I started out pretty good, but then I gave up a couple of hits back to back," Peek told The Herald-Journal after that July outing. "I never did feel comfortable because I'd throw one good pitch and one bad, and I didn't know what was causing it." 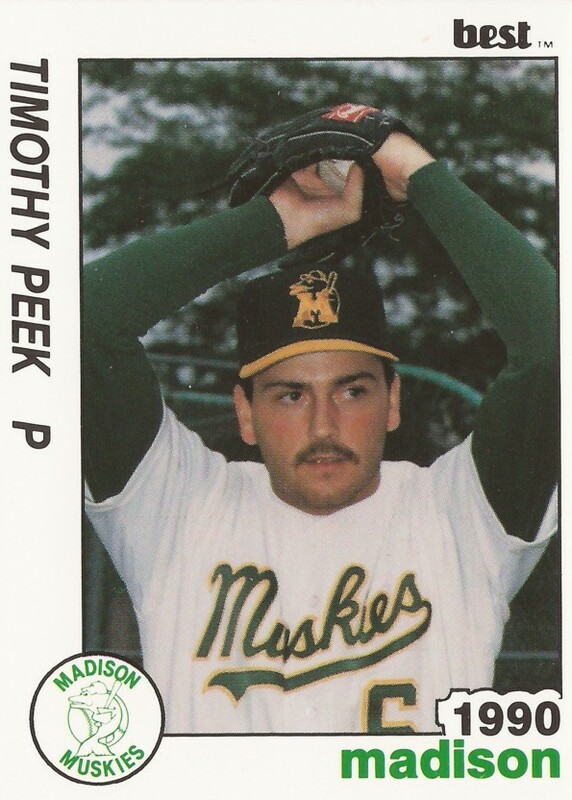 Peek moved to the Athletics and single-A Madison for 1990, then AA Huntsville for 1991. In 1991, Peek saved 26 games for the Stars. His 18th save came in a July game against Knoxville. Peek made AAA Tacoma for 1992 and returned there for 1993, but he never saw Oakland. He moved to the Royals and AA Memphis and AAA Omaha for 1994 and then played his final pro games in 1995 back with the Athletics at AAA Edmonton.